Retirement Daze: Happy birthday, Stella! 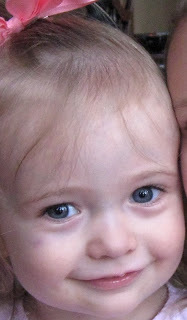 Our youngest grandchild, Stella, turns two today. Son Walt and daughter-in-law Sarah had moved their family from Mississippi to Georgia a month prior to Stella’s birth. I had the luxury of arriving several days after Stella joined the family. It was a joy to get acquainted with the newest Skupien and to serve as mommy’s helper with Stella’s three siblings. That little girl was already remarkable. I know, I know - grandmothers are always prejudiced. But this little one was definitely absorbing her new environment with an intensity that amazed me. She would look for her siblings when she heard their voices, and I was thrilled with her concentration during my one-sided conversations with her. What an audience! Stella has approximately six more days before the status of youngest Skupien grandchild and great-grandchild passes to Walker Vincent Skupien. I love that these two cousins will have a birthday month in common. Happy birthday, Stella! @Kathy - Thanks! We were not able to make the trip to Georgia for this birthday, but we did sing happy birthday by phone and hear her mom's report on Stella's latest antics!